In this review, we present the current state of biodiversity knowledge for the class Staurozoa (Cnidaria), including richness estimates, geographical and bathymetric distributions, substrate use, feeding, behavior, life cycle, and conservation. Based on non-parametric, statistical incidence estimators, the global inventory of 50 known and accepted species of stalked jellyfishes might be regarded as close to complete, but we discuss possible bias related to the lower research effort applied in the Southern Hemisphere. Most of the species occur at mid-latitudes, presenting a distributional pattern that disagrees with the classic pattern of diversity (higher richness near the Equator). Specimens are frequently found on algae, but they have also been reported attached to rocks, seagrasses, shells, mud, sand, coral/gorgonian, sea cucumber, and serpulid tube. Most of the species are found in the intertidal and shallow subtidal regions, but species of Lucernaria have been reported at more than 3000 m deep. 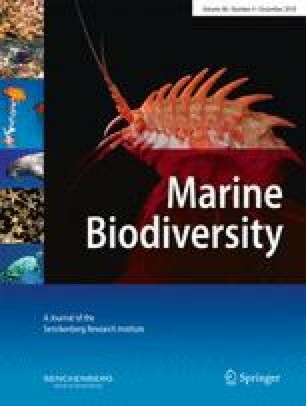 Amphipods and copepods are the prey items most frequently reported, and stauromedusae have been observed being actively preyed upon by nudibranch mollusks and pycnogonids. Apparently, stalked jellyfishes have a high sensitivity to anthropic impacts in the environment, and promotion of the class, one of the least studied among Cnidaria, is perhaps the best possible conservation strategy. The online version of this article (doi: 10.1007/s12526-017-0721-4) contains supplementary material, which is available to authorized users. We are grateful to David Fenwick for providing information about staurozoan species on the list of UK BAP priority marine species and to Sofia Stepanjants for providing the list of distributions for the Far East representatives of Stauromedusae. We are also grateful to Massimo Avian and Stefano Piraino whose comments helped improve the quality of the manuscript. This study was supported by: Fundação de Amparo à Pesquisa do Estado de São Paulo 2010/52324-6 (ACM), 2011/50242-5 (ACM), 2013/50484-4 (ACM), 2010/07362-7 (LSM), 2015/23695-0 (LSM); Conselho Nacional de Desenvolvimento Científico e Tecnológico 474672/2007-7 (ACM), 563106/2010-7 (ACM), 562143/2010-6 (ACM), 477156/2011-8 (ACM), 305805/2013-4 (ACM), 445444/2014-2 (ACM), 142270/2010-5 (LSM), 165066/2014-8 (LSM); and Comissão de Aperfeiçoamento de Pessoal de Nível Superior PDSE 16499/12-3 (LSM), PNPD (LSM).